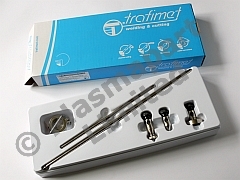 Trafimet wheeled cutting guide kit suitable for use with the Trafimet CB 70 and Cebora CP 70 torch. Consists of magnetic centre pivot, point centre, two bars and the machined torch holder. This pack is supplied as shown, and contains 1 wheeled guide kit & allen key.